Worlds will soon collide for the latest installment of American Horror Story, and by the looks of the first trailer, trouble starts early. AHS: Apocalypse, which premieres September 12 on FX, combines the stories of 2011’s Murder House and 2013’s Coven. “It’s the end of the world,” we learn at the opening of the trailer, as an air raid siren blares over the charred remains of Los Angeles. OK, so they’re jumping right into the “apocalypse” theme, and we’re so on board. 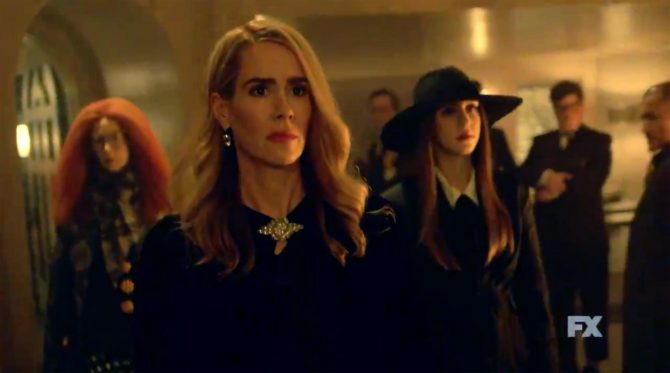 There’s a first glimpse of Jessica Lange’s Constance, Sarah Paulson’s Supreme witch Cordelia, and Emma Roberts’ Madison Montgomery — all characters reprised from Coven. And there’s one very special addition. 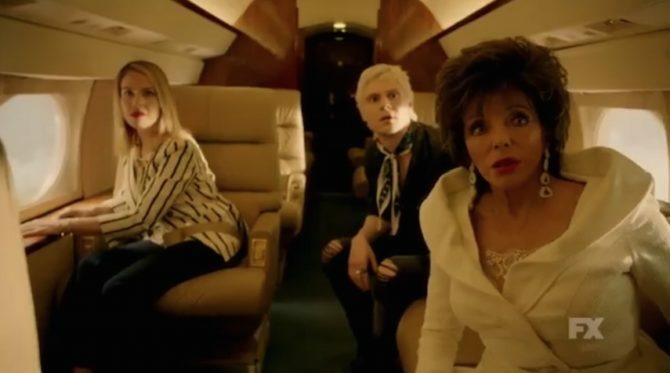 Dame Joan Collins pops up in the trailer as glammed-out grandmother of Evan Peter’s character. So Madison Montgomery and whoever Frances Conroy played in Coven are alive? Again? Must be nice to work in Ryan Murphy’s writer’s pen where consistency and believability don’t exist. It’s a horror/scifi franchise literally about monsters, witches, demons, ghosts, vampires, aliens, and serial killers with about a dozen actors playing all the major roles for 8 seasons and you’re talking believable? LOL. Gimme a break. Well it is considered a horror genre ergo t.. he allowabilty of making dead characters come back to life. American Horror Story has not disappointed me with its story lines. Excellent storyline!! Eh, I didn’t like the attitude AHS took during Coven- it was very frivolous, seeping with gross shock value, and campy without being as poignant and clever as the first two seasons. Freak show was a bit better but as soon as Lange left and they replaced her with Gaga of all people, the show condescended to itself majorly. Also, love Ryan Murphy but his signature move is fleeing whatever show he’s, leaving it malnourished in the hands of others, and lassoing us in with something else. Glee betrayed it’s clever satire and became an after school special series so did Popular, Nip/Tuck became disgustingly devoid of humanity…..he’s not a great finisher.